Every year, our Impacts of Civic Technology conference TICTeC increases, in both size and ambition. The event in Paris last week — the fifth annual TICTeC — was a total sell-out despite having a larger capacity than in previous years. At times the schedule featured an unprecedented four simultaneous tracks, giving delegates more to choose from but also perhaps, making those decisions a little more difficult. And while we’ve naturally always striven to be as diverse and inclusive as possible, it was also the first TICTeC where female speakers outnumbered male ones. There were 76 speakers from 14 different countries. Of these, 39 were women. Delegates came from 29 nations around the world (frustratingly, as always, some of our speakers had their visas turned down, which is not only disappointing in terms of the event’s overall diversity, but also means we don’t get to hear the view from those particular corners of the world). 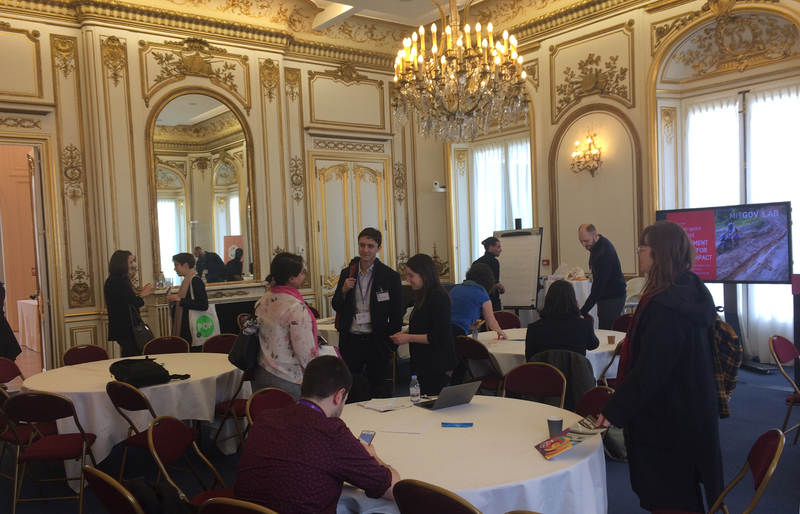 Thanks to our hosts the OECD, we were able to enjoy state of the art conference rooms, and spaces within a château that came complete with their own chandeliers. Within these gilded walls we heard from a diverse range of speakers, engaged in debates and found commonalities across our work in Civic Tech. It’s always so gratifying to hear directly from the practitioners, academics and funders who can share their real-world experiences: thank you so much to everyone who spoke or ran a session. And of course, massive thanks to our sponsors, Google and Luminate, who made the whole event possible. Thank you also to the MacArthur Foundation for providing travel grants to some attendees. Keynote Alessandra Orofino opened the conference with a truly inspiring presentation about tackling ‘platform politicians’ of the far right, something she’s had plenty of practice with through Nossas, the organisation she founded in Latin America. Sounding a very welcome note of optimism, Alessandra assured us that “the next generation will save democracy if we let them”. You can watch the whole session on YouTube and we highly recommend that you do: we knew it had been a hit when even the cameraman was moved. In the French Context session, we were given a great overview of France’s very timely hopes for Civic Tech, including participatory budgeting and citizen decision-making. Deputy Mayor of Paris Pauline Véron, Paula Forteza MP and Tatiana de Feraudy from Decider ensemble spoke very convincingly about how the time is ripe for more collaborative, open democracy: as Paula noted, when she first invited us to bring TICTeC to Paris, none of us had any idea that it would be such a timely event — but with the rise of the gilets jaunes and the Grand Débat National put in place by Macron as a way for everyone to have their say in decisions around four major areas including Democracy and Citizenship, it could hardly have been more relevant. See the whole conversation here. Our day two keynote was James Anderson from Bloomberg Philanthropies, who ran through several examples of local governments grasping the reins and making innovative, imaginative decisions against a ‘crisis of legitimacy that is unprecedented within our generation’. He also reminded us of the ‘huge power in calling out a status quo that isn’t giving us the results we want’; there was lots lots more to interest anyone who’s wondering how we can solve the democratic issues of our time; catch it all by watching the livestream of the session here. The Civic team at Facebook have been guests at every TICTeC since the 2016 event in Barcelona: they’re always keen to report on the ways in which they are using the platform’s enormous reach in order to increase democratic engagement; and because it helps complete a rounded picture of the Civic Tech world, we welcome the opportunity to hear from a tech giant. This year, Director of Product Management Samidh Chakrabarti, Data Scientist Monica Lee and Product Manager Antonia Woodford detailed the tools, systems and increased staffing they put in place to counteract abuse and disinformation during the US midterm elections. At Facebook’s request, this session was not videoed, but it was much tweeted. Also unforgettable was the reception we were given at the French National Assembly: thanks very much to Paula Forteza and her team for hosting us there and giving us this special opportunity to see inside France’s ‘lower house’, where Mounir Mahjoubi, Secretary of State for Digital Affairs, gave TICTeC attendees a fulsome welcome and outlined their vision for Civic Tech in the tricky political climate that France is currently facing. He echoed Paula’s words from her earlier presentation at TICTeC, saying that while previously they were delighted if a few thousand citizens took part in their consultations, they are now overwhelmed by the take-up of millions who want to have their voices heard. Digital democracy is certainly having its moment. We’ll be adding videos of several more sessions as soon as they’ve been edited, as well as photos and slides from as many presentations as possible. There are several ways to make sure you’re informed when they’re ready to view: watch our Twitter stream, sign up to our newsletter, or just check the TICTeC website for the latest updates. If it’s just the videos that you’re interested in, you can also subscribe to our YouTube channel. Earlier this month, Mark laid out the concept of a Democratic Commons for the Civic Tech community: shared code, data and resources where anyone can contribute, and anyone can benefit. He also talked about exploring new models for funding the kind of work that we do in our Democracy practice at mySociety. For many years, our Better Cities work has been proof of concept for one such model: we provide data and software as a service (FixMyStreet, MapIt, Mapumental) to paid clients, the revenue from which then funds our charitable projects. Could a similar system work to sustain our Democracy practice? 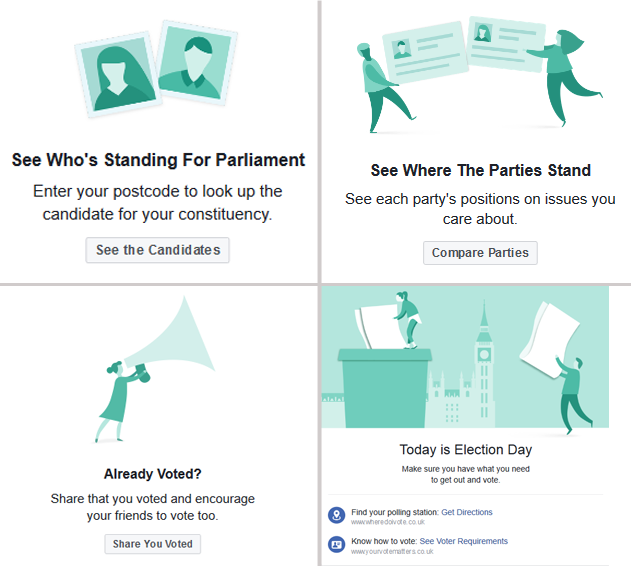 That’s the hope, and with Facebook who we first worked with during the UK General Election in June, providing the data that helped people see and connect with their elected representatives, we’ve already seen it in action. This kind of project is positive on multiple levels: it brings us an income, it brings the benefits of democratic engagement to a wider audience than we could reach on our own, and it contributes data back into EveryPolitician and Wikidata, that everyone can use. The UK election was only the first for which we did this work: we’ve gone on to provide the same service for the French elections and more recently for the rather more eventful Kenyan ones — currently on hold as we await the re-run of the Presidential election next month. And now we’re doing the same for the German elections, where candidate data is being shared this week. As we’re learning, this is definitely not one-size-fits-all work, and each country has brought its own interesting challenges. We’re learning as we go along — for example, one significant (and perhaps obvious) factor is how much easier it is to work with partners in-country who have a better understanding of the sometimes complex political system and candidates than we can ever hope to pick up. Much as we might enjoy the process, there’s little point in our spending days knee-deep in research, when those who live in-country can find lists of candidates far more quickly, and explain individual levels of government and electoral processes far better. Then, electoral boundaries are not always easy to find. We’ve used OpenStreetMap where possible, but that still leaves some gaps, especially at the more granular levels where the data is mainly owned and licensed by the government. It’s been an exercise in finding different sources and putting them all together to create boundary data to the level required. Indeed, that seems to be a general pattern, also replicated across candidate data: at the national level, it’s easy to find and in the public domain. The deeper you go, the less those two descriptors hold true. It was also at this point that we realised how much, here in the UK, we take for granted things like the fact that the spelling of representatives’ names is usually consistent across a variety of sources — not always a given elsewhere, and currently something that only a human can resolve! What makes all the challenges more worthwhile, though, is that we know it’s not just a one-off push that only benefits a single project. Nor is the data going straight into Facebook, never to be seen again. Much of what we’re collecting, from consistent name data to deep-level boundaries data, is to be made available to all under open use licenses. For example, where possible we can submit the boundaries back to OpenStreetMap, helping to improve it at a local granular level across whole countries. The politician data, meanwhile, will go into Wikidata and EveryPolitician so that anyone can use it for their own apps, websites, or research. There are also important considerations about how this type of data will be used and where and when it is released in the electoral process; finding commercial models for our Democracy work is arguably a more delicate exercise than on some of our other projects. But hopefully it’s now clear exactly how a project like this can both sustain us as a charity, and have wider benefits for everyone — the holy grail for an organisation like us. At the moment it’s unclear how many such opportunities exist or if this is a one-off. We’re certainly looking for more avenues to extend the scope of this work and keen to hear more ideas on this approach. Your contributions help us keep projects like EveryPolitician up and running, for the benefit of all. Millions of people reached for their phone on June 9, and checked Facebook for the result of the UK General Election. Now, you may or may not be one of those people yourself, but there’s no disputing that many of us turn to social media as our primary source for big news. Through the night, Facebook was a place where we could express feelings about the results as they came in, share news stories and ask questions: it gives us a rounded view of an event like an election, quite unlike any you’ll receive from traditional media. We’re glad to say that mySociety has been working alongside Facebook to help make this happen. mySociety has a mission to make democracy more accessible for everyone, and via our websites TheyWorkForYou and WriteToThem, we serve and inform more than 400,000 UK citizens per month. That figure has, as we’d expect, spiked in the last few weeks as people rush to check their MPs’ track records, all the better to cast an informed vote; but all the same, we’re well aware that 400,000 users is only a small proportion of the country’s electorate. What’s more, our research has consistently shown that our services don’t adequately reach the people that need them most: our typical user is male, reasonably affluent, well-educated, older and white — I mean, we’re glad to be there for everyone, but generally speaking this is a demographic that can inform itself quite readily without any extra help. That’s not a problem Facebook has, though, with their 32 million UK users. 75% of them log in on a daily basis, and almost half are under the age of 30*. 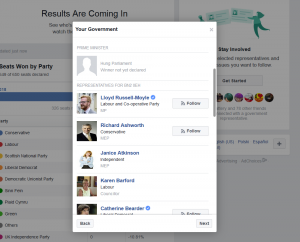 That’s why we were so keen to join forces with the Facebook Civic Engagement team, to help this large online audience see who their representatives are today. You may not have been aware that Facebook has a dedicated political engagement team — unless you came to TICTeC this year, of course, in which case you’d have seen a walkthrough of the extensive research that’s gone into their election offerings globally — but if you use Facebook at all, and if you’re in a country that has recently had an election, you’ve probably seen some of their work. 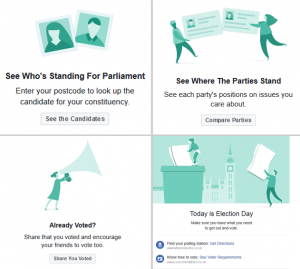 Over the last few weeks in the UK, people on Facebook were alerted to each stage of the electoral process. They were invited to check who their candidates were and what they stood for; offered a reminder to vote and provided information on where and how to do so; and finally, encouraged to share the fact that they had voted, tapping into the proven peer encouragement effect. Thanks to our experience running TheyWorkForYou and WriteToThem, plus the support we receive from Commercial Evaluations and their Locator Online service and our involvement with Democracy Club’s WhoCanIVoteFor.co.uk, we have access to accurate and up-to-date data on candidates and representatives at every level, from local councillors up to MEPs, and including MPs — all linked to the relevant constituencies. In all, this totaled around 23,000 people. What we needed to discover was how many of them were on Facebook — and could we accurately link our records to their Facebook pages? Working together with Facebook, we built an admin tool that displayed likely pages to our team, on the basis of names, locations and the really giveaway information, such as ‘Councillor’, ‘MP’ or the constituency name in the page title. Some representatives didn’t have individual pages, but ran a party page; those counted too (and of course, a fair proportion of representatives have no Facebook presence at all). While our tool filtered the results reasonably well, it was still necessary to make a manual check of every record to ensure that we were linking to the correct representative, and not, say, someone who happened to have the same name and live in the same town. We needed to link, of course, only to ‘official’ pages; not representatives’ personal pages full of all those things we use Facebook for on a day-to-day basis. Those holiday snaps, Candy Crush results and cat memes won’t help constituents much: what we were looking for was the kind of page where constituents could message their reps, find out about surgery times, and get the latest news from their constituency. Now of course, until the results came in, no-one knew precisely which candidates would be MPs! So a small crack team of mySociety people worked through Thursday night to do the final matching. It was a very long night, but we hope that the result will be an awful lot more people following their representatives, and so quite effortlessly becoming more politically engaged, thanks to a platform which they already visit on a regular basis. *Figures based on this post. Comments Off on Happy Birthday to KąVeikiaValdžia.lt! One of the projects we have supported in the past, KąVeikiaValdžia.lt has celebrated its first Birthday yesterday! If you go to the main site today, you will find that the current layout also contains their Facebook widget, which is something that gains on importance even more this week, as Emilis is looking at even more engagement with their current and hopefully new audiences via this particular social network. Starting next week Emilis will set up separate Facebook fan pages for activities of various Lithuanian MP’s feeding information on each of them directly from the KąVeikiaValdžia.lt policy feed. That means around 140 Facebook fan pages to administrate, so we do not know what to expect in reality. Emilis wants to give Facebook users the opportunity to follow the activities of their MP’s within the social network, and provide the MP’s themselves with yet another channel to reach out to the community. People will be able to follow the updates there, MP’s will be able to add their own bits, though at this stage Emilis seems to prefer to maintain the admin rights to those pages. He will ensure the transparency of the idea by posting specific information on each of the pages explaining the process and providing the links: to the original feed from the KąVeikiaValdžia.lt site but also links to other fan pages of each MP. Each fan page will also contain a disclaimer that it is not the official Facebook presence of the MP. Initially Emilis is looking at setting up fan pages for those MP’s who already know the policy feed and are in touch with him (one of the contacted MP’s was happy about the idea). Considering the content of all 140 fan pages will be automated, we will have to wait and see what the actual workload and feedback to this idea will be. I am personally very excited about it and cannot wait to see first pages – I have asked Emilis to share the links with us on our open Facebook group. Feel free to join us there, but we will keep you posted on the blog as well. Join us on Facebook, follow us on Twitter! Comments Off on Join us on Facebook, follow us on Twitter! We are using this blog to update you on recent developments in CEE MySociety and supported projects. This is the place we use for start of discussion. However we would also like to provide you with channels for reactions and on-going dialogue, as well as more access to what we do. So if you want to talk to us in the group, please join us on Facebook here. If you prefer Twitter, you can follow us here! Come over and say hi!